These screens are made out of 1" Sq. Mesh; #18 Nylon (170 lb tensile strength) #18 Poly (99 lb. tensile strength) or #36 Nylon (339 lb. tensile strength), knotted netting, bordered with a black 3/8" polypropylene rope on all four sides and reinforced corners. Treated with a black weather-protective coating. Calculate your size below. 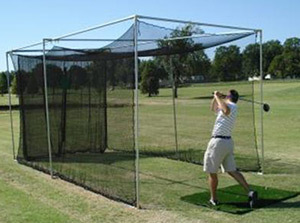 GOLF SCREEN NETS ARE MADE ON ORDER, AND ARE NOT RETURNABLE, EXCEPT FOR MANUFACTURER DEFECTS. Our Heavy duty golf cages are made with 1" Sq. Mesh #18 knotted Nylon. All edges are bordered with 3/8" poly rope, and a center rope for added support. Black in color. 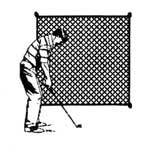 Our Heavy duty golf cages are made with 1" Sq. Mesh #36 knotted Nylon. All edges are bordered with 3/8" poly rope, plus a center rope for added support. Black in color. Corner Frame Kit Includes: 3/4" corners to build your own 10' x 10' x 10' or 10' x 10' x 20' cage. We sell only the corners and tees, because it costs more to ship the 10ft uprights than it does to buy locally at a home improvement store.